After a day and night of exploring Sydney and watching some light shows during the Vivid Festival, we left the city and headed to our hotel for a night. Because we had to catch a morning flight the next day, my friend and I decided to stay near the airport. 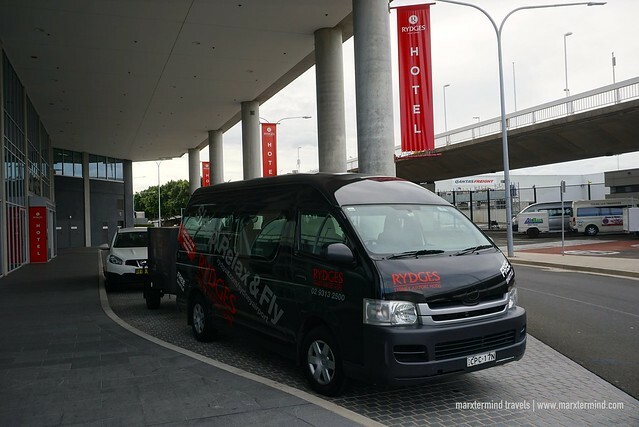 Looking at the several hotels that are close to the airport, I then got curious about Rydges Sydney Airport Hotel. I always see this hotel when I go out from the airport terminal in Sydney since it is literally just next to it. So when there’s a need for me to stay in an airport hotel, I picked this hotel. 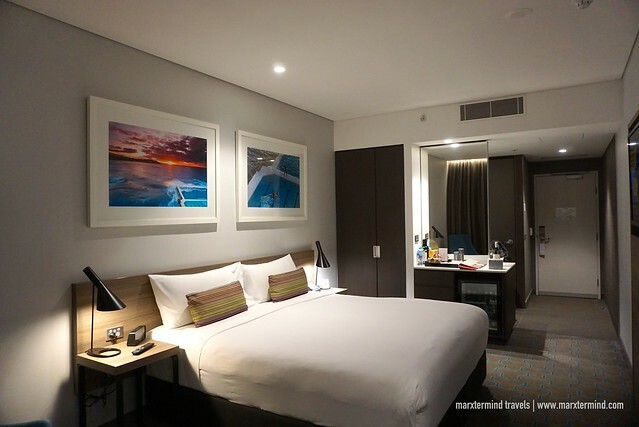 Rydges Sydney Airport Hotel is a modern airport hotel offering lavish rooms and suites with deluxe amenities. 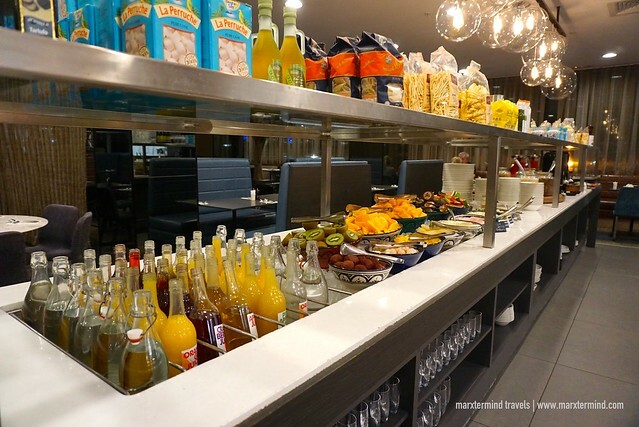 It is located at the international terminal and the only hotel within the Sydney Airport precinct. With a strategic location, it offers convenient access to both domestic and international terminals. The city is also just 13 minutes away from the hotel via airport train link. 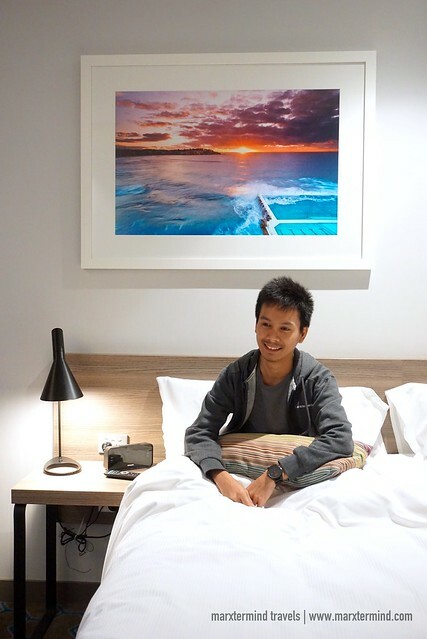 It was already late evening when my friend and I arrived at Rydges Sydney Airport Hotel. 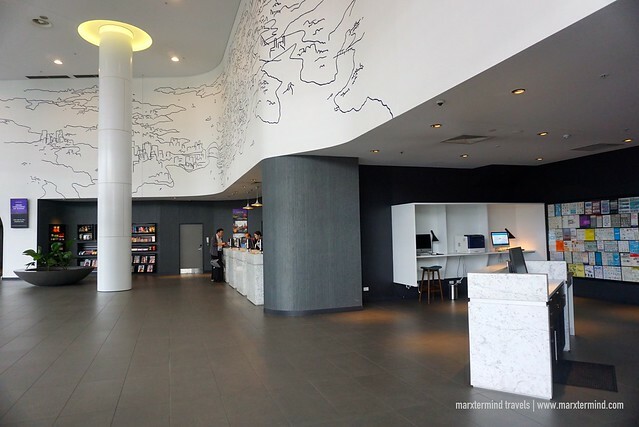 When we arrived, we approached the front desk and the staff warmly greeted us. Then, we presented our passports for our check in. Afterwards, the receptionist handed to us the keycard to our room. Tired and sleepy, I was glad that we were able to check in quickly and our room was already prepared and available for us. Rydges Sydney Airport Hotel offers a range of comfortable accommodation options whether you’re traveling for business or leisure. The hotel has 318 guest rooms and suites categorized into following: Superior Room, Deluxe Room, Family Room, Deluxe Suite, Family Suite and Superior Special Access Room. All rooms are spacious and bright with modern furnishings. You may check here for room rate discounts and availability. Our room was a Deluxe Airport View King Room. The room is air-conditioned and looks very clean. It features a king sized Rydges Dream Bed, an open plan bathroom with a separate shower, a work desk and a seating area. Other facilities inside the room also include TV, minibar, ironing facilities, electronic in-room safe, hair dryer and tea and coffee-making facilities. 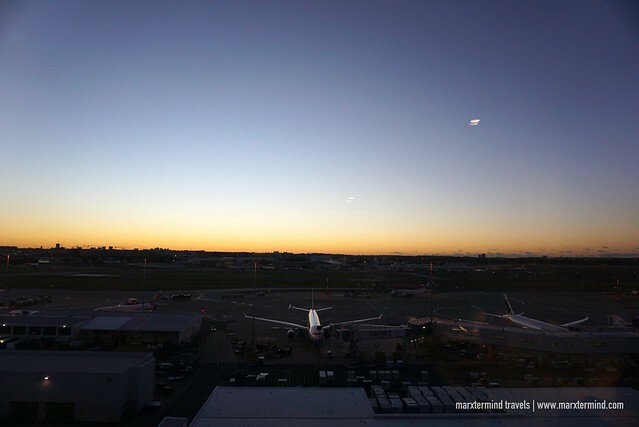 Our room was also facing the airport providing us a sweeping view of the runway and the international terminal. 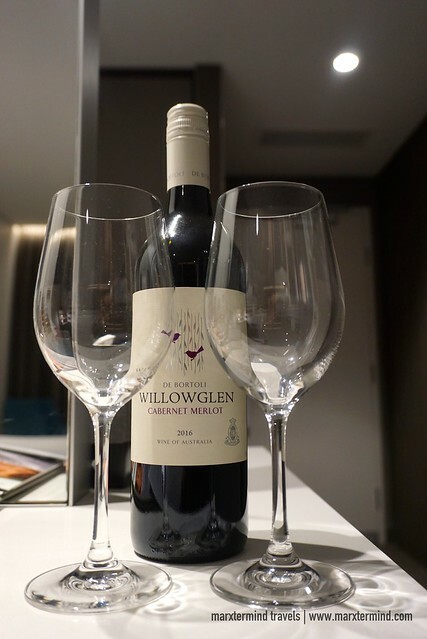 The hotel provided us a complimentary bottle of wine. It could have been a perfect night-cap plane spotting while drinking wine. But sadly, it was already midnight when we came. I was dead-tired already that I all I wanted to do was to lay down to my bed and have my much-needed rest. 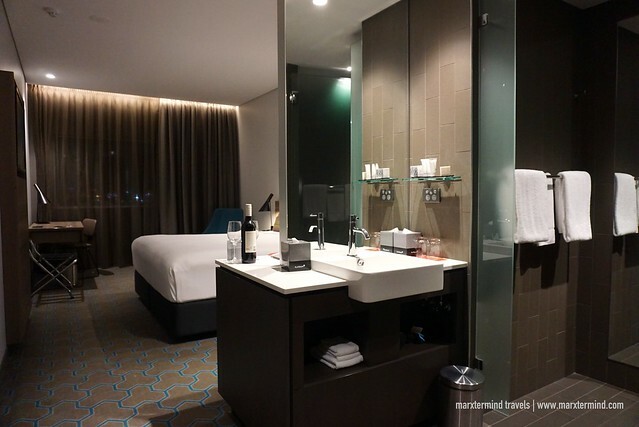 Our room at Rydges Sydney Airport Hotel has everything we needed to have a relaxed night before our early morning flight the next day. The room was huge and felt very comfortable. I had a restful sleep even though it was only for 4 hours. Because of how luxurious and cozy our room was, I regretted why I booked an early flight. I would have wanted to stay longer and enjoy the hotel even more. 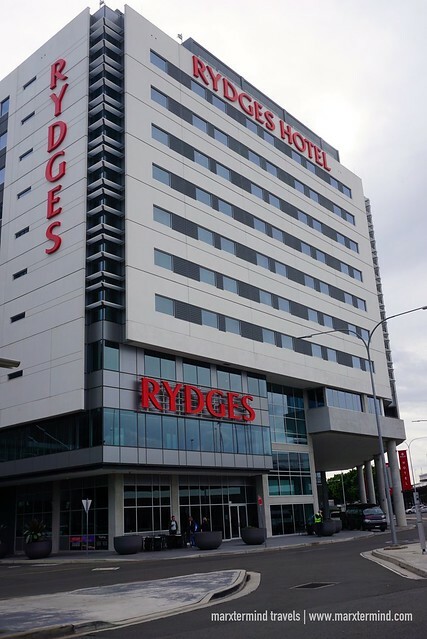 To give guests a more pleasant stay, Rydges Sydney Airport Hotel also has outstanding facilities and a range of 24-hour services such as reception, business center, well equipped gymnasium, and room service. For business travelers, this airport hotel also has function rooms and rooftop venue ideal for meetings, conferences and events. Other facilities that all guests can enjoy also include complimentary Wi-Fi access, concierge, travel desk, luggage storage and free airport shuttle. 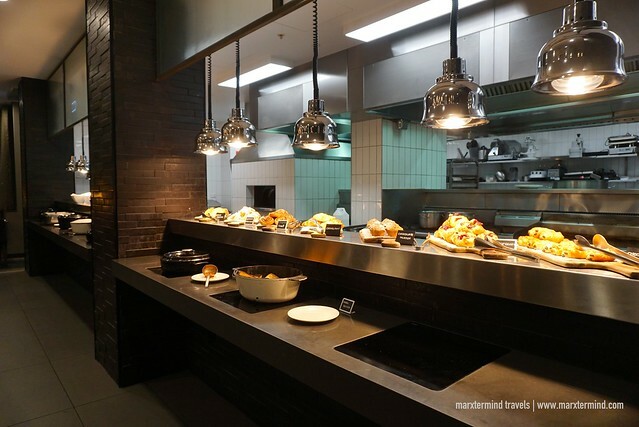 Rydges Sydney Airport Hotel also boast plenty of options for dining. The hotel features several dining options that offer distinct menu and vibe for a casual sit-down meal or quick snack and drink. Its signature restaurant is the Blackwattle Grill. It is open for breakfast and dinner. My friend and I were able to try this during breakfast. We had a morning flight and I was glad that this restaurant was already open as early as 4:30am. The breakfast selection includes sausages, meats, eggs, breads, pastries, spreads, sweets and fruits. Other restaurants in the hotel are The Hub, Touchdown Sports Bar, Touch & Go Cafe and On Cloud 9. 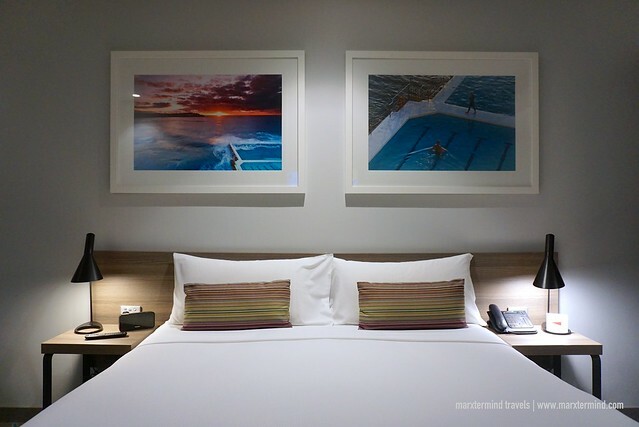 Rydges Sydney Airport Hotel is a perfect choice for accommodation most especially if you’re catching an early morning flight. It has a fantastic location that it only takes 5-minute walk to reach the check in counters of the international terminal. Domestic terminal is also easily accessible through airport or hotel shuttle. I was glad that we stayed here for one night before our flight because it became easier for us to travel to the airport. But more than that, we had an amazing stay in this hotel providing comfort and convenient. I loved the room and felt really comfy during our stay. 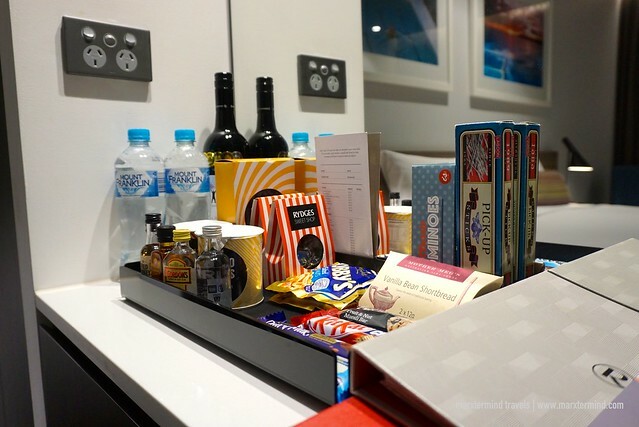 The favorable location, well-appointed room, outstanding facilities and the hospitality from the staff certainly describe why Rydges Sydney Airport Hotel is a top-rated accommodation in Sydney. 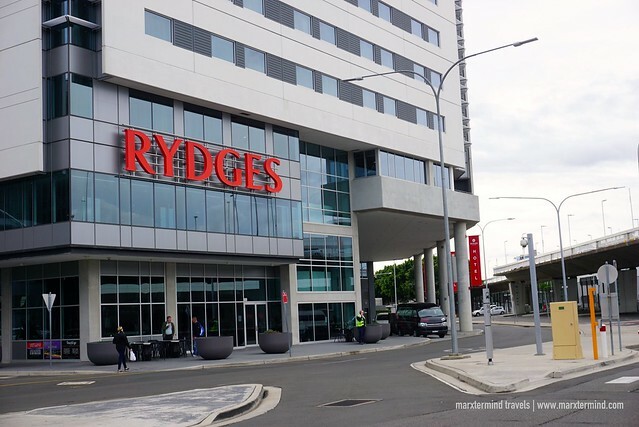 Rydges Sydney Airport Hotel is a Sydney airport accommodation located at the international terminal and just 181 steps to the check in counters. It has 318 spacious guest rooms and suites providing convenience and comfort. Each room is fitted with modern amenities.